Do you struggle with the revision process? Do you sometimes wish you could have someone coach you along as you decide what to include, what to leave out, whether you have the right word, and whether you’re using that word correctly? Do you ever feel overwhelmed when you look at the big picture of the revision, yet get bogged down in the details? Several times over the past few years, I have availed myself of Emma Walton Hamilton’s insightful and thorough manuscript evaluations, which are part of the services she offers as a freelance editor. Now, she has come out with a new product that is (almost) like having Emma sitting next to you at the computer desk, coaching you through the revision process. 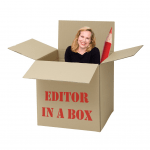 There’s no tea involved and you don’t get to experience the warmth of her smile, but you do get the benefit of her years of experience as an author and an editor through her new Editor-In-A-Box. (Yes, that’s an Emma-In-The-Box popping up in the fabulous graphic.) Note to clarify: this product is designed to guide you as you do your own self-editing/revision. Emma’s actual editing services are separate, and this toolkit doesn’t include a manuscript evaluation. Because the needs of picture book writers and middle grade/young adult novel writers are different, there are two versions of Editor-In-A-Box. Emma is experienced in both types of writing, as an author, an editor, and as a teacher, as the classes she teaches at Stony Brook Southampton University on Long Island include picture books, middle grade novels, and YA novels, and she also teaches all levels in her online courses. With each version, you get a detailed 6-step revision process (in video, written, and checklist format, to suit various learning styles); lists of overused words; basic grammar uses and abuses (the Grammar Owl and I were both glad to see that grammar was included! ); formatting guidelines to help when you’re preparing a submission as well as other information to guide your submission process; information about working with a freelance editor; interviews with professional editors — everything you could possibly need to ensure that your revision process goes smoothly, and covers everything you need to deal with. If you’d like to tell others about this post, feel free to click the “Tweet” button below. Note: Julie Gribble’s fabulous series on the Making of a Picture Book will be back next Monday, September 22. See you then! Sounds so great, Beth! I would love to have Emma “sitting next to me” helping me make my work better! Thanks, Susanna! Emma is always coming up with new tools to help people become the best writers they can possibly be. I purchased “Editor in a Box” for picture books and am working with the material. Emma is an excellent teacher/editor and having her thoughts in a user-friendly binder is priceless. She covers everything you need to know to sumbit a manuscript. I particularly like the PB Editing Checklist. “Editor in a Box” is vey easy to download. The checklist is a brilliant idea, I think! Great that you’re finding it so useful. This sounds amazing, Beth. Thanks for highlighting her product. I would love to take advantage of this at some point! You’re welcome, Penny. It’s ever-green, so once you’ve purchased it, you can use it for every writing project you do. LOL, Erik! 🙂 It is excellent! Having experienced Emma’s editorial advice first-hand, I am certain this is a great tool to have in one’s toolbox. Thanks, Beth. Thanks, Joanna — and thanks for the affirmation of Emma’s skills, as well.